From Hero Cross. The Hybrid Metal Figuration line of die-cast figures returns to North America thanks to HEROCROSS, and the line continues with three figures based on the blockbuster film Batman v Superman: Dawn of Justice - Batman, Superman, and Wonder Woman! 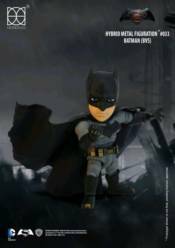 Each metal die-cast figure stands 5' tall, comes with a display stand, accessories (Batarang and grapnel gun for Batman, sword and shield for Wonder Woman, LED-eyes for Superman), and sports 20 points of articulation. Plus, each figure comes with additional pieces that, when collected, will let you build your own Armored Batman figure!